I promised I had some more new recipes ahead! This one came together as I was attempting to use all the remaining produce and pantry items before leaving for Chicago. I wanted to leave with John with plenty of freezer meals to get him through the summer. I saw this recipe for stuffed pepper casserole on Jourdan's blog, and it inspired me to put my own casserole together. *Heat some olive oil (about 1-2 tsp) in a large skillet and add chopped zucchini and yellow squash. Sautee until softened, about 3-5 minutes, then add garlic and cook for an additional minute. 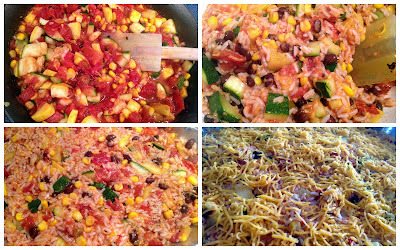 *Add cumin, black beans, corn, and the entire can of diced and fire-roasted tomatoes to the skillet. Stir to combine all ingredients, and cook for an additional minute before removing from heat. 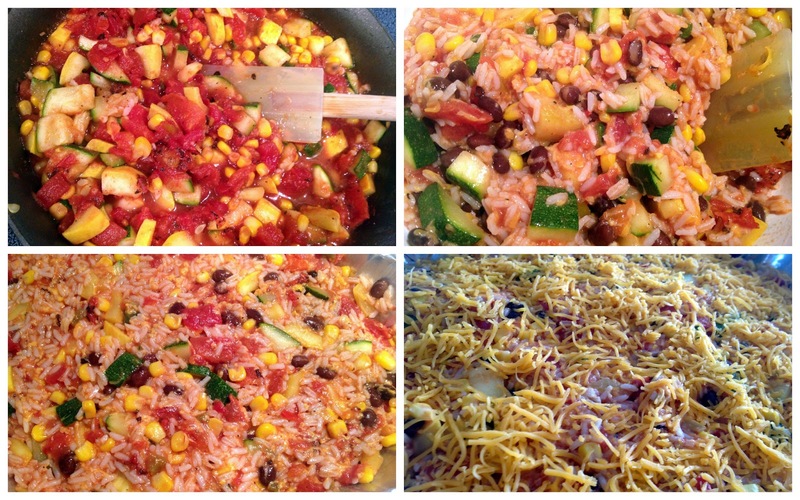 *Combine skillet ingredients, rice and 3/4 cup shredded cheese. Grease a 9x13 pan, and pour mixture into it. Top with remaining 3/4 cup cheese. *Cook for 20-25 minutes, or until warmed through. Ole! Tip: Add some diced avocado for extra flavor! This is an awesome Vegetarian recipe. This is the second time I have made this dish in the last 2 weeks. Today I doubled the recipe to have leftovers for the freezer. This was really yummy and very easy to make! Mexican food is a staple in my household and this will definitely be in the rotation. I went back for seconds last night and can't wait to heat up the leftovers! I edited the recipe a little by sauteing onions with the zucchini and squash, replacing the fire roasted tomatoes with a can of Rotel and adding a little chili powder, paprika and a sprinkle of hot pepper flakes. I used a little less of the cheese ONLY because I'm watching my calories. Thank you for the recipe!!!! Thanks so much, Maya! I love your tweaks to the recipe, and I appreciate you sharing them. I'm going to try out your modifications when I make this for dinner tonight. Thanks again! Just wondering, is the measurement of the rice (2 cups) before or after cooking? Thank you. After cooking. You can use more or less as you'd like, of course!